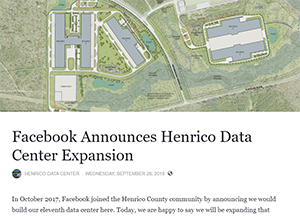 Facebook announced a major expansion of its data center campus in Henrico County, Virginia. Under the plan, Facebook will build two new data center buildings, for a total of five at this campus. Facebook said the expansion builds on its original $1 billion investment in its initial 940,000 square foot campus, and that there are currently more than 800 construction workers on-site and, so far, over 925,000 hours have gone into building the project. Facebook also noted that it is working with Dominion Energy to develop additional renewable energy resources that will support the campus. Construction of the highest-capacity subsea cable to cross the Atlantic is now complete. 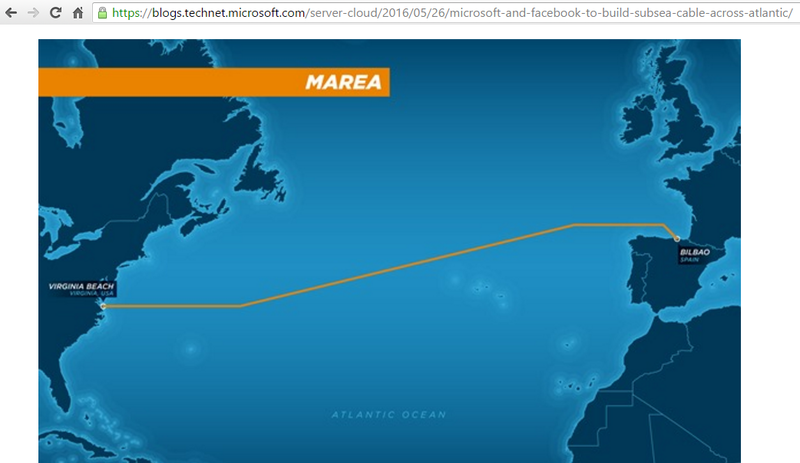 The 6,600 km MAREA subsea cable, which was jointly funded by Microsoft and Facebook, links Virginia Beach, Virginia to Bilbao, Spain. The cable will be managed by Telxius, Telefónica’s new infrastructure company. The cable features eight fiber pairs and an initial estimated design capacity of 160 Tbps. The cable takes a more southern route than other transatlantic cables, which mostly connect northern Europe to the New York/New Jersey region. “Marea comes at a critical time,” says Brad Smith, president of Microsoft. “Submarine cables in the Atlantic already carry 55 percent more data than trans-Pacific routes and 40 percent more data than between the U.S. and Latin America. There is no question that the demand for data flows across the Atlantic will continue to increase and Marea will provide a critical connection for the United States, Spain, and beyond." TE SubCom served as the system supply partner for MAREA. Amazon Web Services (AWS) announced the availability of new High Memory instances for Amazon Elastic Compute Cloud (Amazon EC2) for running large in-memory databases, including production deployments of SAP HANA. Amazon EC2 High Memory instances deliver 6 TB, 9 TB, and 12 TB of memory today, with 18 TB and 24 TB instances coming in 2019. These are the largest memory sizes available in the cloud, according to AWS. SoftBank is testing NIDD (Non-IP Data Delivery) for NB-IoT over its commercial network. NIDD, which is defined by 3GPP, enables users to transmit data to IoT devices without allocating an IP address. Two benefits are cited: better security by not using IP in transmission; and better efficiency by not requiring header information. SoftBank said it aims to leverage NIDD technology to introduce and commercialize devices tailored to various businesses and fields such as crime prevention, social infrastructure and agriculture, making full use of its distinctive features of high security, low power consumption, and high area coverage. The market for compact modular optical equipment is on track to top $1 billion in revenue this year, according to the latest Optical Applications Report from Cignal AI. the category includes equipment designed specifically for use in DCI, open & disaggregated hardware applications. Cignal AI has raised its CY18 forecast for 200G and 400G coherent port shipments and cut its 100G coherent forecast. Ciena and Huawei Top Compact Modular Market Growth – In this record quarter, Ciena and Huawei were the fastest-growing vendors in the compact modular segment. Ciena benefits from its third-generation coherent technology, while Huawei was lifted by greater adoption from Chinese cloud operators. New entrant Nokia also grew share in its second quarter of serving this market. Packet-OTN Market Grows with Incumbent Adoption – More incumbent network operators are using packet-OTN switching hardware to upgrade their transport networks. In North America, this segment grew 30 percent year-over-year as result of more deployments by Verizon and other large incumbents. Growth was also significant in EMEA and India, where Nokia has taken significant market share. Third Generation Coherent Gaining Momentum – Even though the overall market slowed in 2Q18 as a result of ZTE’s shutdown, other vendors experienced healthy sales growth. Third generation coherent solutions are picking up steam with Ciena’s 400G offering doing well. Acacia, Huawei, Nokia, and NTT Electronics based solutions will reach the market within the next two quarters to challenge Ciena’s lead. At ECOC 2018, Synopsys and SMART Photonics, which is a European manufacturer of InP Photonics components with production and research facilities located in Eindhoven, The Netherlands, introduced a production-ready process design kit (PDK) based on SMART Photonics' Indium Phosphide (InP) process. 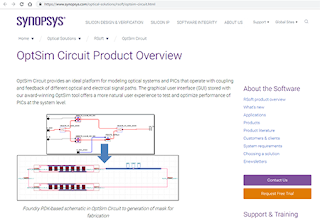 Synopsys said its PIC Design Suite, which comprises OptSim Circuit and OptoDesigner tools, provides a seamless PIC design flow from idea to manufacturing from a single solutions provider. The addition of the SMART PDK to OptSim Circuit, combined with the PDK's availability in OptoDesigner, enables users to use the PIC Design Suite to schematically capture and simulate InP-based PIC designs with the SMART PDK building blocks, and then synthesize and verify a SMART-foundry-compatible layout. 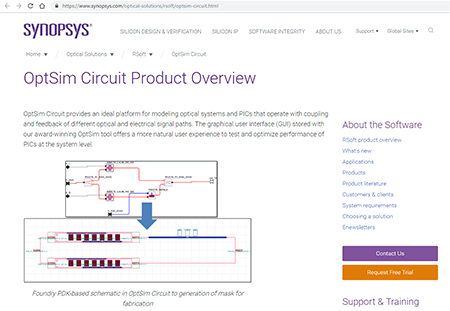 "This is another example of a world-class PIC foundry taking advantage of the new opportunities offered by rapid advances in photonic integration," said Tom Walker, group director of R&D for Synopsys' Photonic Solutions. "We are excited to be working with SMART Photonics and to be able to give our mutual customers the ability to design advanced custom photonic applications using the SMART Photonics InP semiconductor process." At ECOC 2018, Inphi highlighted its ecosystem collaboration with multiple optical solution industry leaders, including AOI, Delta Electronics and Source Photonics, showing readiness in delivering 100Gbps and 400Gbps PAM4 based module solutions for hyperscale cloud data center networks. 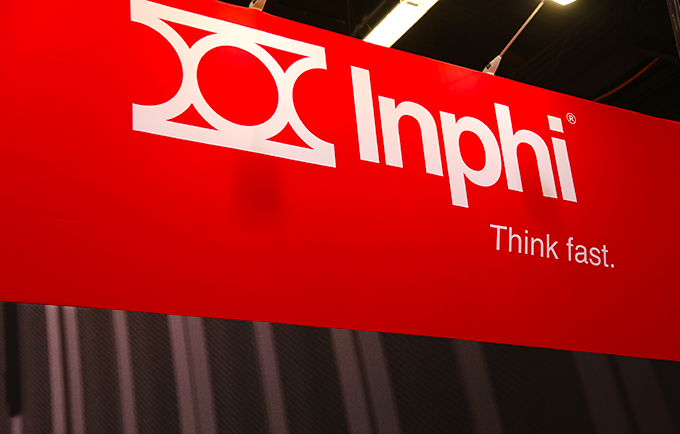 “We work closely with Inphi on 100Gbps and 400Gbps PAM4 based solutions. We see the emergence of 100Gbps and 400Gbps PAM4 solutions for next generation of hyperscale cloud data center networks and Inphi is one of the leading companies providing advance technologies,” said Ted Kuo, CBU BU Head at Delta Electronics Inc.
PAM 4 Testing - DSA8300 sampling oscilloscope with an 80GHz optical sampling module showing support for IEEE 802.3bs based 400G optical testing for TDECQ, including new advances in high-sensitivity single-mode/multi-mode optical measurements for NRZ and PAM-4. PAM 4 design and debug- DPO70000SX 70GHz ATI performance oscilloscope analyze single shot PAM-4 signals with live triggering and post-equalized error detection for 400G standards. Complex Coherent testing - an end-to-end demonstration of optical modulation analysis software supporting multi-OMA systems, featuring the AWG70000 Series Arbitrary Waveform Generator and the DPO70000SX oscilloscope for applications such as spatial division multiplexing and more. Nokia Bell Labs will serve as Technology Partner to UK-based sailing team Alex Thomson Racing. Skipper Alex Thomson, supported by his onshore team, will compete in the next Vendée Globe race, a 24,000-mile solo, non-stop unassisted sailing race around the world. The next Vendée Globe is scheduled to begin in November 2020. The Vendée Globe race is often described as "the ultimate physical and psychological challenge" especially as the boats traverse the Southern Ocean. Nokia Bell Labs said it will work alongside Thomson - and his IMOCA 60 race boat – to develop and test both existing and new cutting-edge technologies including augmented intelligence and wearables. Nokia Chief Technology Officer and Bell Labs President, Marcus Weldon, said: “We are delighted to be working with Alex Thomson Racing to push the limits of what is possible, and pioneer breakthroughs in the seamless integration of human talent and technological performance, in extremely harsh and often remote environments, in a race against time. "Alex Thomson Racing represents an important microcosm of the broader industrial IoT and mission-critical network focus of Nokia. This collaboration is another step toward realization of our Future X Network Vision, where human existence will be transformed in an era defined by the digitization and connection of everything and everyone with the goal of automating much of life, effectively creating time, by maximizing the efficiency of everything we do."